• INNOVATION FOR EVERY INDUSTRY: Data scientists and researchers can quickly tap into the power of NVIDIA AI with the world’s fastest GPU architecture and optimized deep learning software containers. It’s a powerful tool for tackling some of the most complex problems facing humankind. Providing early detection and finding cures for infectious diseases. Finding imperfections in critical infrastructure. Delivering deep business insights from large-scale data. Even reducing traffic fatalities. Every industry, from automotive and healthcare to fintech is being transformed by NVIDIA AI. • SAY GOODBYE TO DIY: NCG empowers AI researchers with performance-engineered AI containers featuring deep learning software such as TensorFlow, PyTorch, MXNet, TensorRT, and more. 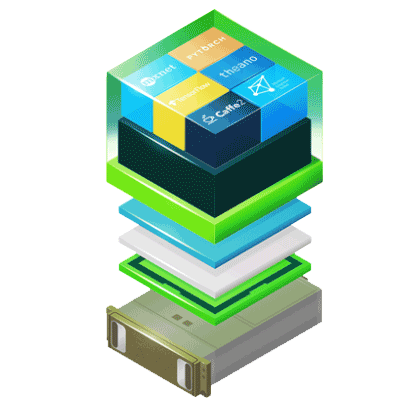 These pre-integrated, GPU-accelerated containers include NVIDIA® CUDA® runtime, NVIDIA libraries, and an operating system. They are tuned, tested, and certified by NVIDIA to run on NVIDIA DGX™ Systems, NVIDIA TITAN (powered by NVIDIA Volta and NVIDIA Pascal™), and Amazon EC2 P3 instances with NVIDIA Volta. This lets users tackle challenges that were once thought to be impossible while eliminating difficult, time-consuming DIY software integration. • ACCESS FROM ANYWHERE: The catalog of NGC optimized deep learning framework containers is available to everyone—at no cost—for use on participating cloud service providers, NVIDIA DGX Systems, and select NVIDIA desktop GPUs. Containerized software allows for portability of deep learning jobs across environments, reducing the overhead typically required to scale AI workloads. Developers and data scientists experimenting on an NVIDIA DGX Station or a PC with an NVIDIA Volta or NVIDIA Pascal-powered TITAN GPU, enterprises with NVIDIA DGX-1 in the data center, and organizations using NVIDIA GPUs in the cloud now have access to a consistent, optimized set of tools. This means users can spend less time on IT and more time experimenting, gaining insights, and driving results with deep learning. • SIMPLIFYING APPLICATION DEPLOYMENT ON A CLUSTER: Installing an HPC application requires that all libraries, compilers, and dependencies of the application are up to date and match with the cluster. Shared systems must support hundreds of applications with different requirements, making installation even more challenging. Containers eliminate the need to install the application, letting users easily run an HPC application on a cluster. • ACCESSING THE LATEST FEATURES AND PERFORMANCE IMPROVEMENTS: The third-party managed HPC application containers for the latest application verisons provide additional features and better performance. Upgrading an application on a shared system is a challenge because the host may not have the right software stack required by the new version. Containers are agnostic to the underlying system, allowing users to take advantage of the application’s latest features and improved performance. • RUNNING APPLICATION ON ANY GPU ACCELERATED SYSTEM: All the third-party managed HPC applications available through the NGC registry are designed to run on GPU-accelerated systems. Application users can log into NGC and pull the containers to run on a local workstation, GPU-accelerated HPC cluster, NVIDIA DGX Systems, and in the cloud. This kind of flexibility is changing the way HPC is used to make scientific breakthroughs. • DELIVERING REAL-TIME VISUALIZATION IN PARAVIEW: Surface rendering is a time consuming and an iterative process while volume rendering is extremely slow on a CPU system. The HPC visualization containers are optimized to run ParaView on NVIDIA GPUs so that users can seamlessly take advantage of NVIDIA IndeX volume visualization and NVIDIA Optix ray tracing libraries to render scientific data in real-time. 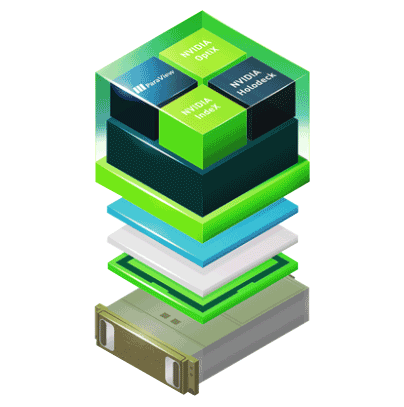 NVIDIA HPC visualization containers bundle these technologies with ParaView so that the user can simply pull and run the containers for enhanced ParaView performance on GPUs. • DEPLOYING VISUALIZATION TOOLS: Containers eliminate the need to install applications on a system, giving users more freedom to run their visualization jobs on different systems. Users can now pull the HPC visualization containers from NGC and run ParaView, NVIDIA IndeX, NVIDIA Optix, and NVIDIA Holodeck on Pascal and Volta GPU-powered workstations, HPC clusters, NVIDIA DGX Systems, and in the cloud. This means that the users no longer have to rely on the system administrators to install the visualization tools. • DRIVING LOW LATENCY REMOTE VISUALIZATION: Remote visualization allows users to simulate and visualize their data on a remote system while the rendered frames are sent back for visual analysis. However, the data between frames is 90% identical, which creates a network bottleneck. NVEnc only sends unidentical data between frames which reduces network traffic, lowers latency, and provides faster results. 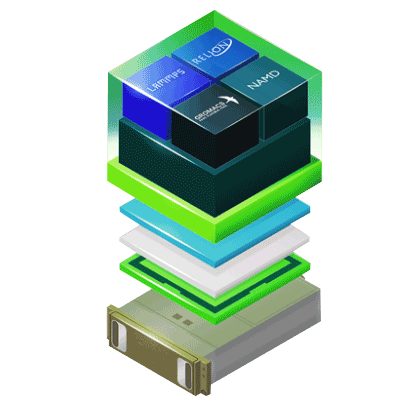 LEARN MORE ABOUT GPU-ACCELERATED CONTAINERS WITH NGC.